Look, we hate having to go to the Royal Mail delivery office on a Saturday morning because the postman couldn't drop off our package, but Amazon's solution is just creepy. 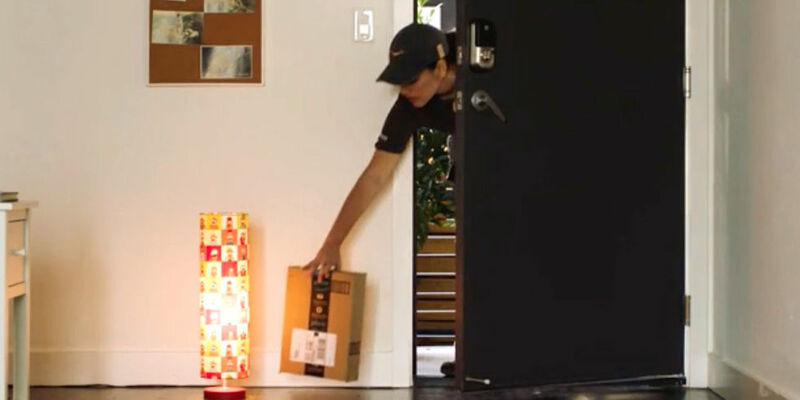 Amazon has just launched a new service that will allow its couriers to actually open people's front doors and drop off the deliveries inside their house. Yeah, that's right. The Amazon key requires the use of Amazon's new Cloud Cam camera and smart lock, allowing delivery drivers to open your front door and place your package "safely inside your home". Now, we're not saying Amazon drivers can't be trusted. But we just don't like the idea of some random person letting themselves into our home. Especially if our pets are at home, they'll be incredibly confused. How does it work? The indoor security camera connects online via your home Wi-Fi, and communicates with the lock in Zigbee, a wireless protocol used by many smart home devices. Amazon couriers then scan a package barcode, and then the camera 'talks' to the lock, and starts recording. Then, the delivery driver can unlock the door using an app. Users can either watch the delivery live, or receive a short video after it has been dropped off. So, it's not completely out of your control, but still. Amazon Key will only be available in 37 US cities from November 8, and it costs $249.99. "These individuals are thoroughly vetted, with comprehensive background checks and motor vehicle records reviews," Amazon said.